Boradband sound pulse propagating across-slope in a 3-D wedge-shaped waveguide. Comparisons of experimental and computed signals (the thick red line corresponds to the experimentally recorded data and the thin black line corresponds to the numerical solution). 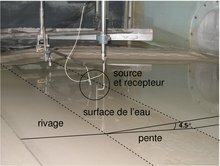 Experimental data recorded during a laboratory-scale experimental campaign led in 2007 in the indoor tank of the LMA-CNRS laboratory in Marseille. Fully 3-D numerical simulations carried out with the 3-D PE model 3DWAPE with a scale factor of 1000:1.